Check out our range of fun hippopotamus facts for kids. Learn what they look like, where they live, what they eat and much more. Read on and enjoy a variety of interesting information about hippopotamuses. Hippopotamuses are found in Africa. 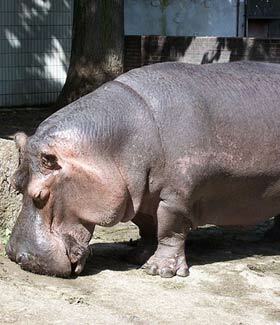 The name hippopotamus means ‘river horse’ and is often shortened to hippo. The hippopotamus is generally considered the third largest land mammal (after the White rhinoceros and elephant). Hippopotamuses spend a large amount of time in water such as rivers, lakes and swamps. Resting in water helps keep hippopotamuses temperature down. Hippopotamuses give birth in water. Hippopotamuses have short legs, a huge mouth and a body shaped like a barrel. The closest relations of the hippopotamus are surprisingly cetaceans such as whales and dolphins. Scientists believe this family of animals diverged in evolution around 55 million years ago. Although hippos might look a little chubby, they can easily outrun a human. Hippos can be extremely aggressive, especially if they feel threatened. They are regarded as one of the most dangerous animals in Africa. Hippos are threatened by habitat loss and poachers who hunt them for their meat and teeth. A male hippopotamus is called a ‘bull’. A female hippopotamus is called a ‘cow’. A baby hippo is called a ‘calf’. A group of hippos in known as a ‘herd’, ‘pod’, ‘dale’ or ‘bloat’.